Yesterday, I watched a video about a girl who is blind and her first driving experiencethanks to her high school classmates. When asked what she would do if she could not fail, the girl did not answer with the usual "make millions" or "be famous" answers. Instead, she said she just wanted to drive a car. Learning that she has some light perception, the girl's classmates devised a plan to surprise her on her eighteenth birthday. They strung hundreds of lights in the school parking lot, resulting in what looks like an airplane landing strip. The girl was able to see the lights and drive in between them successfully, an experience she will doubtless cherish for the rest of her life. As one classmate mentioned, sighted people take being able to drive for granted. For people with vision, it is second nature to be able to get into a car and go wherever they want. For many people who are blind, the ability to drive is a dream, a wish. Being born blind or losing sight before legal driving age deprives many of a pivotal experience of young adulthood. Although driving is by no means the only (or the most important) difficulty or issue facing people who are blind, the first driving experience is a quintessential part of teenage culture. Some, like the girl in this video, can still have this experience with a little help. When I was 23, I met a wonderful man who would eventually become my husband. After only knowing me for a little over a month, this man, one night, told me he had a surprise for me. He took me to a deserted, large parking lot after dark. Confused and a little wary, I was shocked when he turned the car off, took the keys out of the ignition, and handed them to me. "You told me that you've never driven. Well, now you can. I'll help you," he told me. I had told him that, but I had not told him that driving, even just once, was my most treasured dream. Needless to say, I was very nervous, but extremely excited. 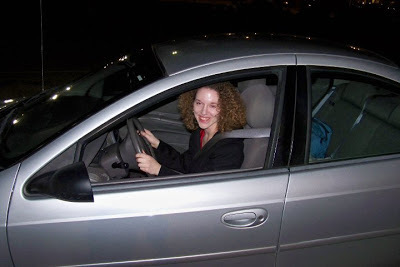 That night in that empty parking lot, my future husband taught me how to drive. As the girl in the video demonstrates, those brakes are touchy! When he took me home, I told him he had made my dream come true. I told my roommate that night that I was going to marry him. She laughed, but three years later, he is my husband. I will never forget that experience. It is difficult to put into words why it was so important to me, as it was to the girl in the video. I think it has to do with how pivotal an experience it is growing up. Although there are other experiences others who are blind and I cannot share with the sighted, this is one life experience that can happen, with a little help from friends. *We at APH would suggest following the driving laws in your state.